Mostly real progress is slow. It took decades to end slavery (which gave way to wage slavery in many places). It took longer to get even some of the most basic rights for women in this country. It took a decade of protest to end the Vietnam War. Decades for gay marriage. I am doubtful multi-partner marriages will be legalized in my lifetime. The triple meltdown at Fukushima hit the accelerator for clean energy solutions in a number of countries. Perhaps most dramatically in Germany, where parts of this shift have been underway for decades. If you stay closely on top of the German energy transition (called Energiewende) you will have no doubt heard that in the early stage after closing reactors after the Fukushima disaster the country was actually opening more coal fired power stations. 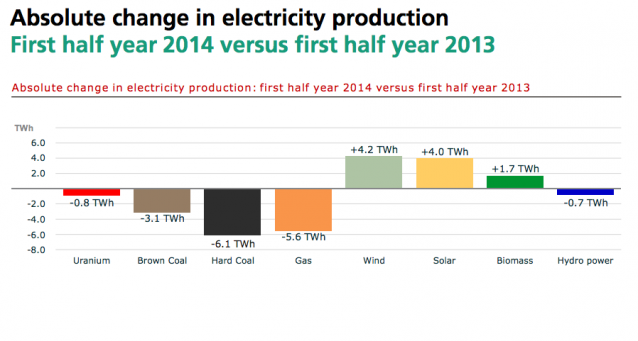 But as the bar chart above shows, the “Fukushima means more coal in Germany” story is old news. These distortions were caused in part by their being a number of incomplete high tech coal plants in the pipeline when Fukushima hit and distortions in the European carbon tariffs which (hopefully temporarily) were favoring coal. 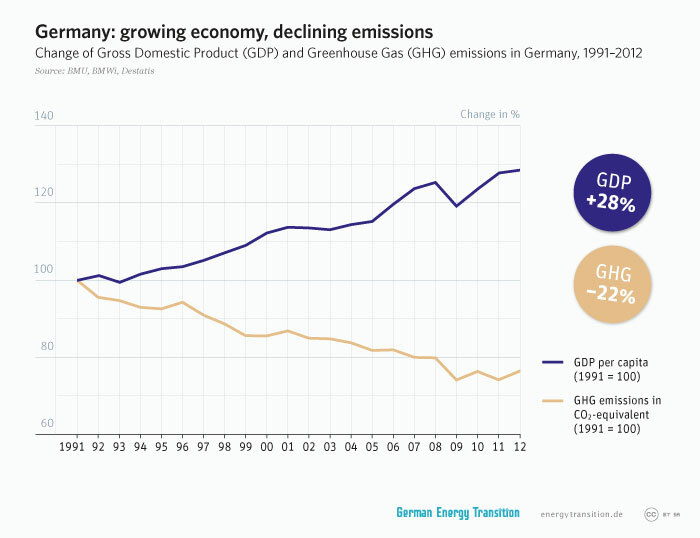 As the longer term graph above shows, unlike many countries, Germany is serious about reducing it’s carbon footprint. Central to it’s success is that more than half of the renewable investment in Germany in recent years has been from individuals (including farmers) rather than large utilities or governments. Japan is arriving later to the party, but is still showing up in significant ways. Most recently there has been an explosion in the number of companies registering to sell electricity. These include Honda Motors, Panisonic, Softbank and some giant Japanese homebuilding companies. This is critical, because unlike Germany, Japan has 10 nuclear power utilities which have had a monopoly on electricity sales. The government for it’s part has (like Germany did) created above market pricing for power which is generated from renewables. Even before the opening of the market, Japan has seen a surge in home/business electric generation for personal/industrial use. The Japanese court just handed anti-nuclear activists a rare victory in stopping the restart of 2 reactors. 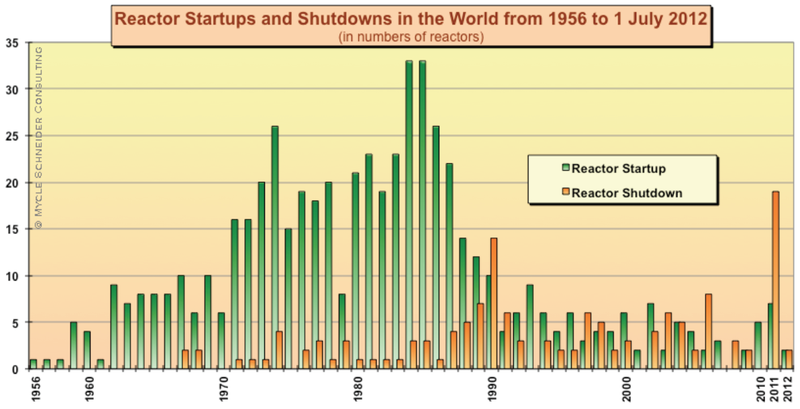 Japan, unlike the US, does not have a single authority to restart it’s currently closed 48 reactors. Even the newly restructured safety authority is telling the Abe administration that they need to check with local governments before restarting reactors, even if the safety authority says it is okay. Recently elected anti-nuclear provincial governor Taizo Mikazuki of Shiga prefecture on July 13th, indicates that the Abe governments plans to restart reactors are far from secure. The longer Japan continues to function will all of it’s reactors off and without blackouts, the less plausible the utilities arguments are that they are completely necessary to run the country. Germany has the solar profile of Alaska. Japan has very few conventional energy resources. Both countries are using tax structures, market mechanisms, feed in tariffs and public education campaigns to change the ways they produce energy. Germany is ahead of schedule to close all it’s reactors by 2022. Japan currently has all its reactors closed. These were the number 3 and number 4 nuclear countries in the world (after the US and France). It is far form a done deal, but the above graph shows an important trend. It is worth pointing out that at a 25% capacity factor, the installed wind power worldwide represents the equivalent of 35 full size reactors – which is still a long way for replacing the almost 400 operating reactors worldwide, but if you compare it to 6 reactor equivalents in place in 2009, you can see that this real progress in energy is moving right along. What we hear from many critics of renewable energy is that these clean forms of power are “not yet ready for prime time”. They can not contribute in a meaningful way to the tremendous energy needs of civilization on the planet. So let’s take a look at 2013 and see. Both sides of the nuclear issue spin their story. If you want the most favorable framing of the pro-nuclear side, one of your best sources is the World Nuclear News. In it’s year end report for 2013 WNN reports that there were 4 new reactors which connected to the grid (3 in China, 1 in India) and 4 old reactors taken offline (all in the US). If we add the additional capacity from uprates (improvements to existing reactors) over the year and the fact that the closed reactors were smaller in total capacity than the added ones, we get about 2 GW electric of expanded nuclear capacity worldwide. This is about 2 new reactors worth. 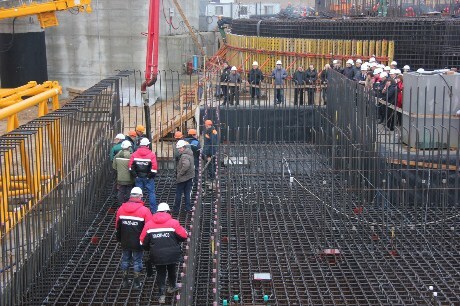 New reactor construction in Belorus build by Russians. In contrast, 37 GW of new solar power were put online worldwide according to the European Photovoltaic Industry Association. Remember, to compare this with reactors, you need to multiply this number by the capacity factor, which is about 25% for PV panels. Thus this represents about 9 new reactors worth of electricity. What is especially exciting about this report is Japan is jumping into solar PV in a big way, installing 6.9 GW of new capacity, second only to China. 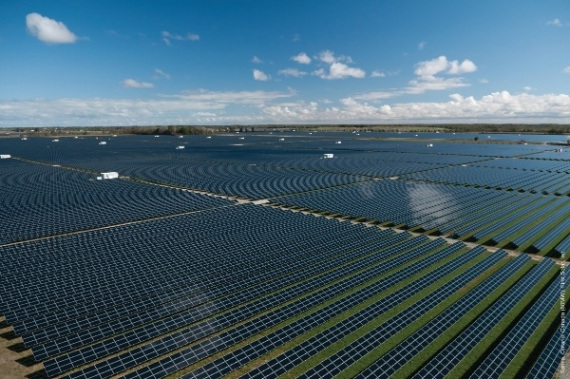 SolarBuzz which predicted last year’s growth within a single GW is forecasting new installed PV will hit 49 GW in 2014, the equivalent of a dozen new reactors. 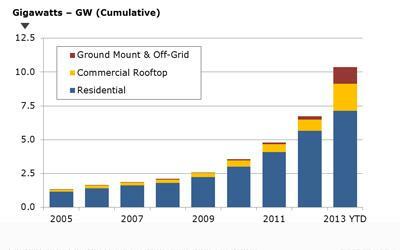 New wind power grid connections in 2013 were at about the same level as solar PV, at 34 to 35 GW. But the capacity factor for wind averages around 42%, so this actually represents closer to 15 full size reactors displaced. 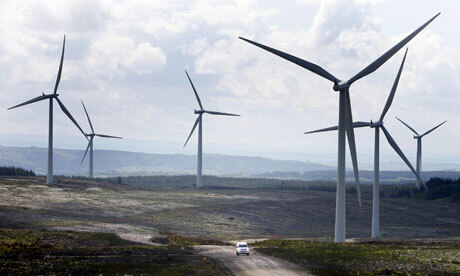 Worldwide wind is also expected to be grow by 45 to 48 GW in 2014 or about 20 new reactors worth. In the wind rich US, the total wind power contribution was 4.1% of all electricity generated. This is compared to only 1% in 2008. So at the height of the nuclear construction boom world wide, just before Chernobyl, 33 reactors (on average smaller than the 1 GW ones used for comparison above) were connected to the grid in a single year. 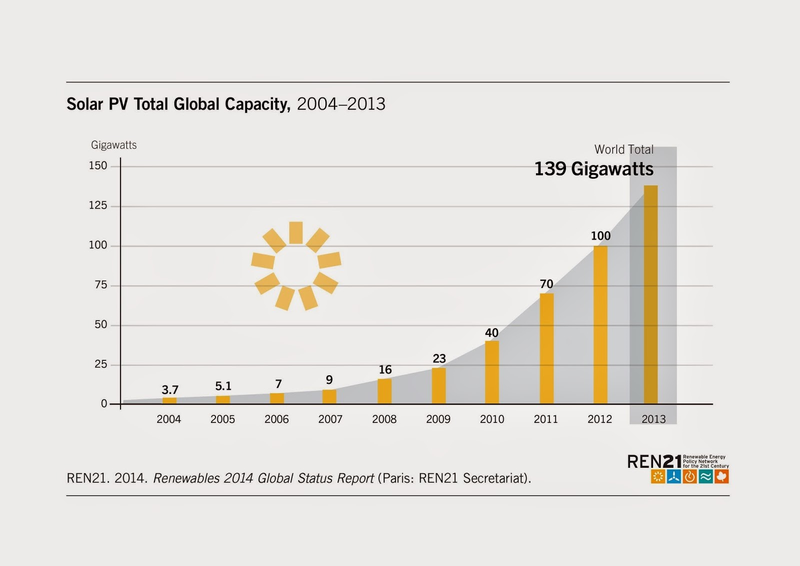 2014 will see just wind and solar PV combined will hit that number. There are only 435 reactors operational worldwide (including 48 in Japan which are currently shutdown and have a very unclear future). If we are adding 25 to 35 reactor equivalents a year in renewables, the “not ready for prime time” argument sounds as foolish as the “too cheap to meter” claim. For decades being an anti-nuclear activist has meant the endless reading of bad news. Despite years of warning that accidents like Fukushima and Chernobyl were possible or even likely, the better funded and more experienced media making machines on the pro-nuclear side dominated the conversation and media coverage. This is finally starting to change (though we are still tremendously outspent by the likes of the NEI). This months good news comes again from the Sustainable Energy News Summaries. These are my picks (from the 70 mostly encouraging stories) for the month. The format here is that i have quoted the story summary and then afterwards in italics i have added my commentary and in some cases graphics. Although the direct operational and societal benefits of smart meters and the broader benefits of smart grids that are enabled by smart meters continue to be debated among policymakers, utilities, regulators, and consumers, penetration rates continue to climb, reaching nearly 39 percent in North America in 2012. According to a recent report, “Smart Meters,” the worldwide installed base of smart meters will grow from 313 million in 2013 to nearly 1.1 billion in 2022. In North America, the growth in installed base will come primarily from medium-sized and smaller utilities that will shift to smart meters as they build business cases for upgrading their metering infrastructure. Smart meters matter because markets matter. With smart meters you can have variable rate electricity pricing (as they already do in the Czech Republic for example). This means you can reward people for doing their laundry in the middle of the night with low electricity rates. Huge efficiencies are available if we simply balance our demand over the day. The solar photovoltaic market continues to grow as PV technology costs have steadily declined and pathways to further cost reduction are being pursued. By the end of this decade, solar PV is expected to be cost competitive – even without subsidies –with retail electricity prices in a significant portion of the world. According to a recent report, “Solar PV Market Forecasts,” annual installations of new solar PV capacity will more than double, in terms of capacity, by 2020, growing from 35.9 gigawatts in 2013 to 73.4 GW in 2020. Distributed systems will account for less than half of all installations in 2014, and non-distributed systems will represent more than half of the market through 2020. 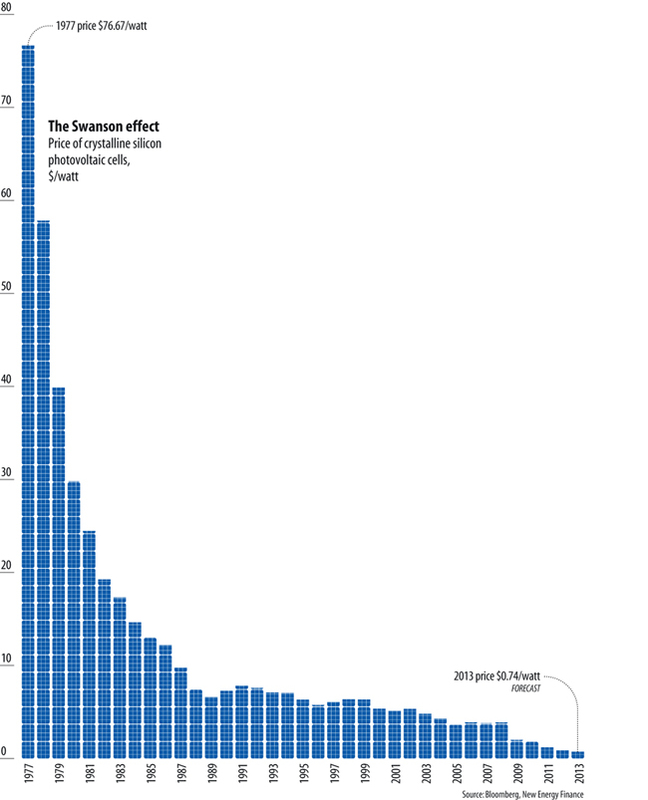 Solar capacity factors run on average around 25%. This means that 73 GW would replace about 18 full size nuclear power plants. But what is really important here is “ever without subsidies” and the rate at which this is growing – doubling in 6 years. The reason this is important is that it will continue to drive down the unit cost of solar PV, shortening the payback time and inspiring people who have no interest in the environment at all, to buy solar solutions because they are the cheapest. Southern Power is considering bidding on solar energy projects in Georgia that regulators want to see built by utility Georgia Power as part of the state’s long-term energy plan, according to documents filed with the Public Service Commission. Southern Power is the wholesale energy unit of Southern Co., while Georgia Power is one if the Atlanta-based company’s regulated utilities. The Georgia PSC convinced Georgia Power to agree to add 525 megawatts of solar to its system. Historically, Southern Co. and its utilities have not supported renewable energy development, arguing that the South’s climate is unsuited for solar and that the technology was too expensive compared with power from its coal-fired generation fleet. Southern Company by market value is the third largest utility in the world. It is of course pathetic that in the sunny southern and often sea side portion of the country they have fought against renewables for so long, but now they are changing their minds. This is an indication that 1) even the most Neanderthal of energy executives are coming around. 2) renewable energy economics are already irrefutably good. Southern Company is building one of the only nuclear power projects in the US at Vogtle 3. Vogtle 3 is already late and over budget. Tens of thousands of new electric cars are zipping into traffic this year, and with them come a trunkful of strategies about how to recharge them. There are at least four ways to go: recharging slowly through a standard 120-volt wall socket, the type a consumer would use for a hair dryer; buying a faster 240-volt home charger, about the size of a garden gnome, for several thousand dollars; plugging into the same 240-volt charger in a public parking space but paying a price; or using a $30,000 superspeedy public charger that takes only minutes but is not widely available. The only consensus is that the more opportunities there are to recharge, the better the sales of vehicles that can generally go fewer than 100 miles between plug-ins. i am not an especially large fan of electric cars, mostly because at the end of the day they are still cars. If we are going to have cars, which seems likely for the foreseeable future, then lower ecological impact ones would seem a prudent way to go. There is a standardization race currently underway for how these vehicles will be charged. What is missing from the above brief story is that Tesla motors, the US premium electric car company is setting up a network of proprietary charging stations for it’s luxury electric cars. For those who own Tesla’s highest end vehicles, refueling is free. 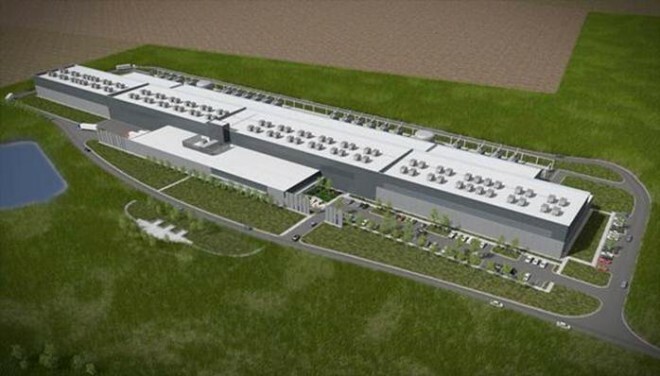 Facebook passed another milestone in the green data center arms race with the announcement that its Altoona, Iowa data center will be 100 percent powered by wind power when it goes online in 2015. This will be Facebook’s second data center — after its Lulea, Sweden location — to run on all renewable power. 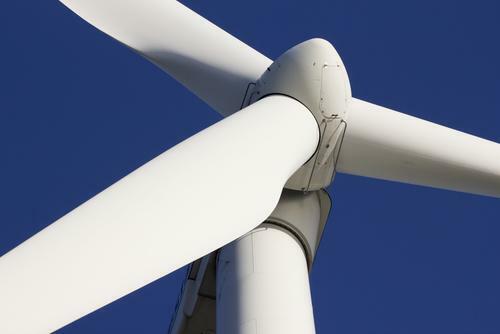 The electricity for the new data center will come from a nearby wind project in Wellsburg, Iowa. Both the wind project, which will be owned and operated by MidAmerican Energy, and the data center are currently under construction. Facebook has a goal of powering its data centers on 25 percent renewable energy by 2015. Did this building kill a nuke? The important part of this story is not in the summary about but at the bottom of the article itself: “When Facebook said back in spring that they were going to Iowa, the utility company in Iowa, MidAmerican Energy, announced that they were shelving plans to build a new nuclear facility and then filed plans to build a wind plant instead,” Facebook is hugely problematic for me, but if their data centers are going to knock out reactors, i am willing to hype their efforts. As of October, only eight states had enacted legislation to amend their RPS policies, and 2013 is now projected to go down as yet another year of overall RPS advancement. The most significant demand-side changes to RPS policies in 2013 involve new requirements and resource carve-outs in Colorado (S.B. 252), Maryland (H.B. 226) and Minnesota (H.B. 729). The collective new benchmarks likely will support more than 1,000 megawatts of additional renewables, including more than 500 megawatts of solar. Further, no supply-side RPS amendments enacted thus far in 2013 seem likely to have an immediate, significant or detrimental impact on renewables as a whole. What is important here is that in 2013 the conservative inspired ALEC anti-renewables legislative agenda basically failed. AND that ALEC appears to be rethinking its assault on clean energy in favor of something “gentler”. With a bit of luck the grave stone for the nation will not have ALEC’s name etched in it as the cause of death. Philips has just offered its first turnkey lighting-as-a-service model to the Washington Metropolitan Area Transit Authority. WMATA will upgrade more than 13,000 lighting fixtures at no upfront cost and pay for the project, plus a ten-year maintenance contract with Philips, through the $2 million savings the LEDs will provide annually. 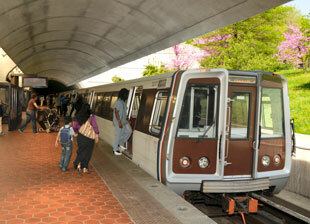 The switch to LEDs will reduce energy costs at Metro’s garages by 68 percent. The savings from the maintenance alone is expected to be about $600,000 annually. With this deal, Philips has won its first lighting-as-a-service performance contract. Although other industries operate on performance contracts, lighting manufacturers traditionally have not. This story is about understanding how money decisions get made and figuring out how to tap the incredible economies of efficiency correctly. Here we see the company which makes LEDs helping the end user get over their resistance to switching by having a no entry cost option. The huge savings could only be accessed when the manufacturer basically pulled at the risk out. “Don’t call it ‘alternative energy'” said my Danish clean energy advocate friend Ann Vikkelso. The proper term is ‘renewable energy’ and her point was that by referring to this robust set of energy solutions as ‘alternative’ it cedes what is normal to the very energy sources we are trying to phase out. So i have written a bunch of what is worth modelling in my fair commune. We are basically crime free, we are highly sustainable with less than 20% the carbon footprint per person than our mainstream counterparts. We run collective businesses without “real bosses”. Full employment. We have an all voluntary work force. Full social safety net. Our kids get lots of attention, love and educational support. We grow much of our own food. We fix many our appliances, vehicles, bikes and buildings. If you are not obsessed with amassing personal wealth (which it seems a huge fraction the people in the US are) it is a completely reasonable place to live. And for those who regularly read this blog, it will be no surprise that the most important thing i think we are a model of is sharing systems. Cars, Bikes, Clothes, Residences, Bank accounts, businesses, work responsibilities. Basically, if it is possible to share it, we try to. The reason i think sharing systems are the most important thing that we model is because more than our renewables and efficiency behaviors, it has the possibility of sparking the great U turn needed to get us out of this ecological jam we are in. And at it’s core all it takes is for us to be better communicators, more trusting and more daring. If we can make those steps, the positive feedback loops of having greater access to resources and needing to do less work for it kicks in and sharing will sell itself.